The „SpaceTime" is a hand-made echo pedal. It combines all the advantages of analog and digital circuits in a unique way. As a result „SpaceTime" is a warm and deep sounding delay pedal, easy to operate, offering analog delay typical self-oscillations, at a maximum delay time exceeding almost every old school pedal. First of all your direct guitar signal stays analog and gets not digitized! There is not a single AD/DA converter involved and therefore your straight guitar signal is free of any digital latency. The full dynamic and rich tone of your guitar are completely preserved. „SpaceTime" offers you three control knobs to adjust your tone. The delay time is set by „Time", the number of echo repeats can be changed by „Repeats" and the volume of the echo signal can be balanced using the „Mix-Level" knob. Additionally a toggle switch divides the „Time"-knob range into three segments: short (up to 150ms), middle (up to 330ms) and long (up to 660ms). A second toggle switch allows you to change the treble content of the echoed signal. Switching from „bright" over „mellow" to „dark" gradually reduces the top end - resulting in warm, deep and analog sounding echos. The straight (non delayed) guitar signal is not affected by this tone control! Thanks to its extremely large signal-to-noise ratio the Vahlbruch „SpaceTime" shows very low background noise and is therefore suited for any studio work and professional live performance. The "SpaceTime" pedal has NO pcb-mounted jacks, NO pcb-mounted footswitch and NO pcb-mounted pots! This certainly means more effort building the pedal compared to industrial mass production but it´s truly worth it! 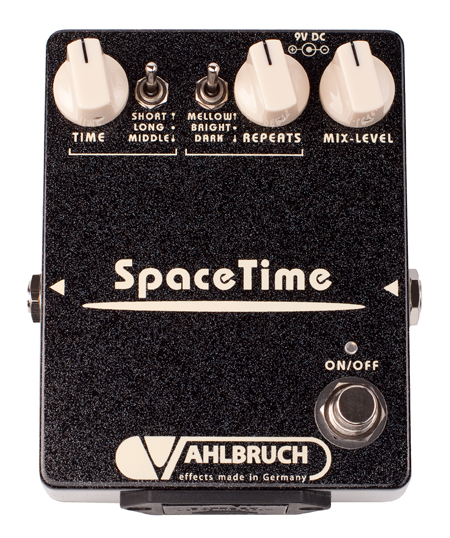 Like all Vahlbruch pedals the "SpaceTime" is hand-made utilizing only the best components available worldwide for high-end tone and years of trouble free operation.